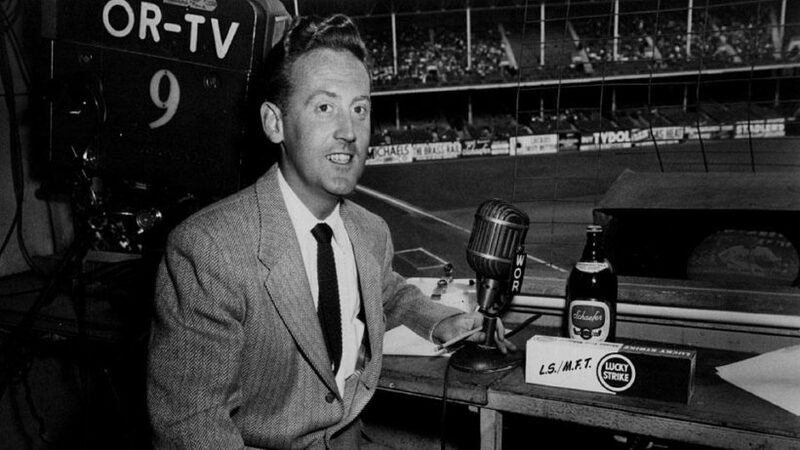 Vin Scully first took the microphone at Ebbets Field 65 years ago and has been broadcasting Dodgers games ever since. 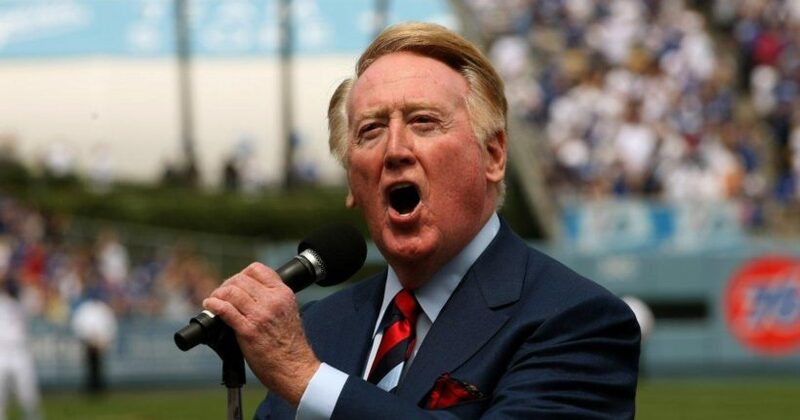 (by Kevin Kernan, NY Post) LOS ANGELES — Vin Scully is the one constant in baseball. The legendary Dodgers broadcaster will retire at the end of the season after 67 years, and we all will be the sadder for it. Everyone loves Vin. The fans, media, players — especially the players. Here is the simple reason behind Scully’s success. “I very much don’t think I’m broadcasting, I just think I’m talking to friends about the game,” Scully, 88, told The Post Wednesday before the Mets played the Dodgers at Dodger Stadium. Vin Scully is the game’s best friend. When Mets catcher Kevin Plawecki homered in Monday night’s 4-2 Mets win, Plawecki had one request. He wanted to get Scully’s call of his home run. “My dad texted me and said he got the chills hearing him just make the call,” Plawecki told The Post. “That’s awesome. Just the history he has had, the games he has called, growing up, hearing a Dodger game with his voice, everything is so cool about it. Plawecki put Scully in perfect perspective. When I told Scully what Plawecki said, a broad smile crossed his face. “That’s the nicest thing anyone can say,” Scully said. Broadcasting legend Vin Scully is calling his final season of Dodgers baseball. This final go-round is a little difficult on Scully because he never wants to overshadow the game. Friends have gone out of their way to visit him in the booth. “Terry Collins was so nice to come up here and visit,” Scully said. “He and Joe Maddon come up in uniform, amazing. “And some of the kids who have grown up here and have become big leaguers, they might come up just to say hello. Giancarlo Stanton, he came up with a ball, asked me to sign it, funny things like that. It’s not that I’ve done anything, they were little kids and I’m still here. That is the delightful impact Scully, 88, has on the game, broadcasting Dodgers games since 1950. Vin gets it. He is never center stage. He lets the game breathe. Most of all, he knows how blessed he is to have been able to graduate from Fordham in 1949 and become a broadcaster with the Dodgers in 1950 and continue for all this time. In any language, Vin is magic. “Vin is the greatest friend the game of baseball has ever had,” Mets broadcaster Howie Rose told The Post. “He’s Babe Ruth and The Beatles all rolled into one. “The fact of the matter is he has set the bar so ridiculously high,” Rose said. “I come to the ballpark to see friends,” Scully said. Vin Scully is the sound of the game. Published May 11, 2016 at The New York Post. Reprinted here on May 12 for educational purposes only. 1. The purpose of an editorial/commentary is to explain, persuade, warn, criticize, entertain, praise or answer. What do you think is the purpose of Kevin Kernan’s editorial? Explain your answer. 2. Tone is the attitude a writer takes towards his subject: the tone can be serious, humorous, sarcastic, ironic, inspiring, solemn, objective, cynical, optimistic, critical, enthusiastic…etc. 3. What inspires you most about Vin Scully? Visit the Vin Scully website.